Recombinant adeno-associated virus (AAV)-based gene delivery is a promising approach to treat muscle diseases. 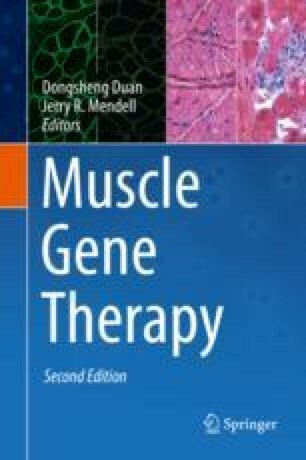 However, body-wide muscle delivery and pre-existing immune responses pose significant challenges to AAV muscle gene therapy. While the determinants of tissue tropism and immunogenicity of AAV are amenable to traditional molecular engineering, the development of a muscle-specific, immunosilent AAV vector has remained elusive. Recent advances in understanding the relationship between capsid structural motifs and functional domains have created exciting developments in the search for a muscle-specific AAV. Novel approaches to generate unique AAV properties through forced evolution have resulted in capsids with improved immune properties and/or muscle-targeting efficiency. Optimization of the gene cassette to restrict expression to mature muscle fibers provides another level of control. These reengineered AAV vectors have the potential to greatly increase efficacy and reduce off-target effects for body-wide muscle gene therapy. In this chapter, we discuss recent advances in the development of a next-generation, muscle-specific AAV vector.